Data centers benefit from the region’s stable environment and market access. 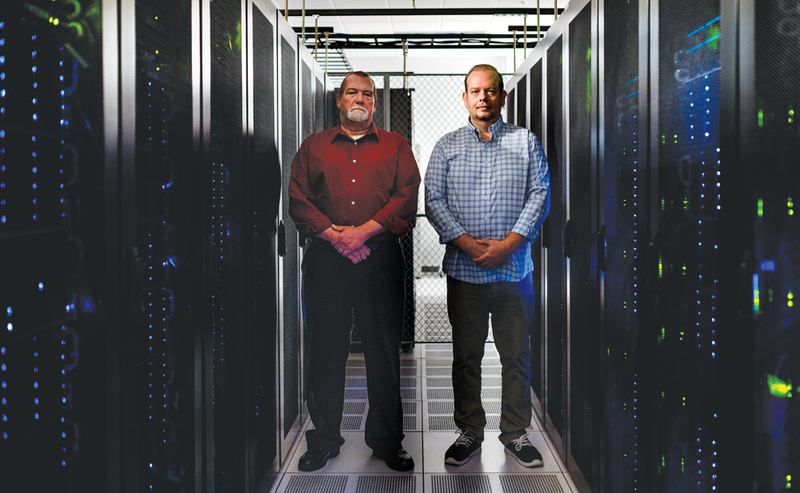 Christopher Hennerberger and Robert Sanders of ManagedWay Co., a cloud services provider in Troy, offer their clients a wide range of server options to store, manage, and transmit data. They also have installed backup energy sources to prevent any power outages. To reach the cloud, first there’s the matter of security. At ManagedWay, a cloud services provider in Troy, every passageway that connects the high-speed server rooms, energy centers, and offices is known as a mantrap. To gain access from one room to the next, the previous entryway must be closed and locked with one of several different security systems. Safeguards are front and center at ManagedWay, given it has a “Tier 3-plus” security rating for managing data for a range of clients, including health care organizations that must adhere to HIPAA standards, automotive OEMs and suppliers, credit card processors, retailers, financial services firms, and educational institutions. The company, founded in 2005, even protects data for other security and storage operations like Barracuda Networks Inc., which has facilities in Ann Arbor and Silicon Valley. The latter company’s clients include Citibank, Coca-Cola, Harvard University, FedEx, IBM, L’Oreal, and Liberty Tax Service; there are more than 150,000 organizations across 100-plus countries. During a recent tour of the 50,000-square-foot facility near Oakland Mall, Sanders and Christopher Henneberger, ManagedWay’s director of operations, showed off an array of rooms equipped with servers, generators, automatic transfer switches, and batteries (multiple energy sources prevent the operation from running out of power). “We have air chillers to keep the servers from overheating, all the servers are set on steel and concrete tiles that are 18 inches above the floor (for running cables and pumping cold air), and some of the servers are protected by a steel fence so only certain people have access via a locked gate,” Henneberger says. Other servers are set in steel cages, preventing anyone from going over or under a barrier. One reason companies like ManagedWay and its contemporaries like Barracuda Networks or 123Net in Southfield have concentrated in southeast Michigan is that the area is consistently rated as one of the safest places in North America — relatively free of natural disasters such as hurricanes, tsunamis, earthquakes, tornadoes, and volcanoes.